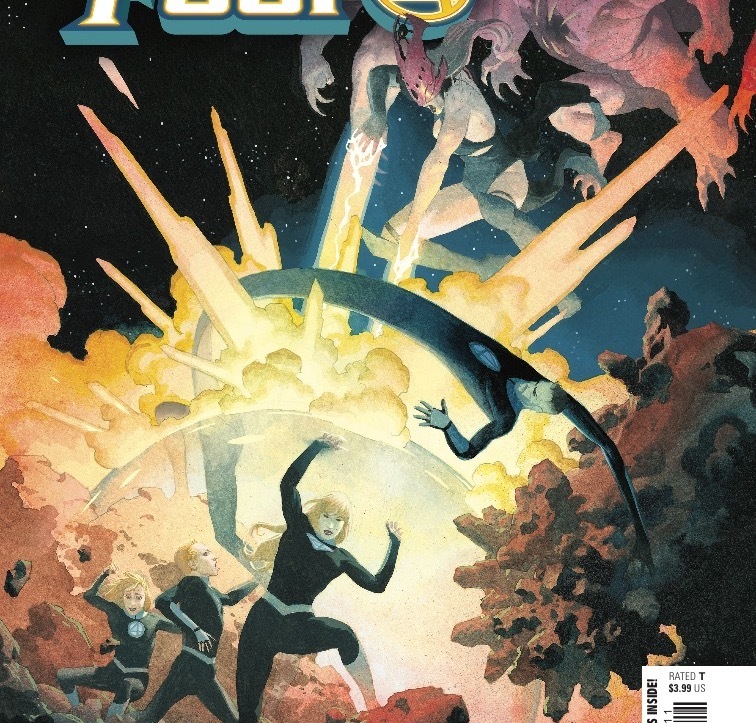 Fantastic Four #2 Review – AiPT! Let’s create universes, shall we? The Fantastic Four series is finally back, but what about the family? In the first issue, we caught up with Thing and Human Torch, but sadly Reed and Sue were barely in the book. Fear not readers, as the fantastic couple is back and they’re bringing the Future Foundation with them. Dan Slott and Sara Pichelli are working these characters long out of the limelight back into the fold. One could argue Chip Zdarsky has been doing that little by little for a while on Marvel Two-in-One, but the actual first family are in this issue and we learn where they’ve been. In hindsight, this issue read after the first is going to be a real treat for anyone who likes their stories in one sitting. The first issue sets up the first half of the team and this second issue delivers on the second half. I’m not sure I would have written them in this order, but here we are. If you were frustrated with the first issue you’ll be calmed by this one. This issue delivers big time on answering questions, like where Reed and Sue have been and what they’ve been doing. It’s not exactly clear why they couldn’t tell Thing and Human Torch what was up, but their mission is an important one and very big in scope. How big? Oh, they’re just helping create universes. No big deal. Slott gives us a rundown on the characters (who have new hero names) in the Richards family as well as Future Foundation characters too. This issue also reveals a brand new villain to contend with who is humanoid, not a god, but as cosmic as the best of them. This issue has big ideas and also a direct conflict. Reed’s daughter Val plays a part in the exciting last third of the issue and boy does Slott leave us on a big time cliffhanger. I can’t say I’m certain it’s actually real, but it’s unexpected and has an event-level reveal. The art by Pichelli continues to be excellent. This issue really lets Sara shine by showing off how these characters are creating universes as well as some creepy/gross villains too. There are also slices of universes revealed in an epic double page layout that’ll make you linger. There are still a lot of questions to answer as well as new ones introduced in this issue. Why the villain strikes at this time is unclear and, like I said above, is that last page really happening? Heck, are Reed and Sue’s powers diminishing like Thing and Human Torch? These questions will probably be answered eventually, but they’re the nagging kind that are more obnoxious than intriguing. The Fantastic Four are finally back at it in Marvel Comics and the creative team is delivering on big time ideas that only the first family could tackle. This is fun comics. A great second issue should put a lot of naysayers in their place. The Fantastic Four are finally back at it in Marvel Comics, and the creative team is delivering on big time ideas that only the first family could tackle. This is fun comics. Reed, Sue, the Future Foundation...it's all back!